Do you have dark skin? Are you seeing dark, pigmented spots on your skin? 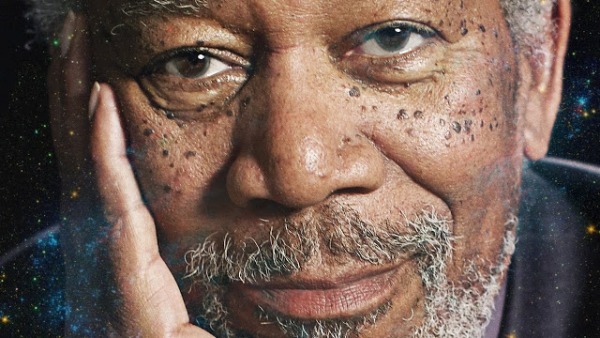 Do these dark spots on Morgan Freeman’s face look familiar? If so, you might be encountering dermatitis papulosa nigra (DPN), a type of seborrheic keratosis that manifests on the dark skin of those of African and Asian descent. You may be freaked out by these skin spots, but don’t be — it’s actually a quite common skin issue. In fact, studies list the incidence in the adult black population at about between 10% to 35%. And though these marks aren’t dangerous, people do seek out treatment because the lesions associated with the condition become more numerous and obvious with age. So, let’s take a look at this condition, and find out what you can do if you want to have your spots removed or treated. I’ve got all these brown moles on my dark skin! What are they? Firstly, don’t worry, they’re not moles — although many people think they are. Because they aren’t moles, they don’t have the potential to turn malignant, aka cancerous. 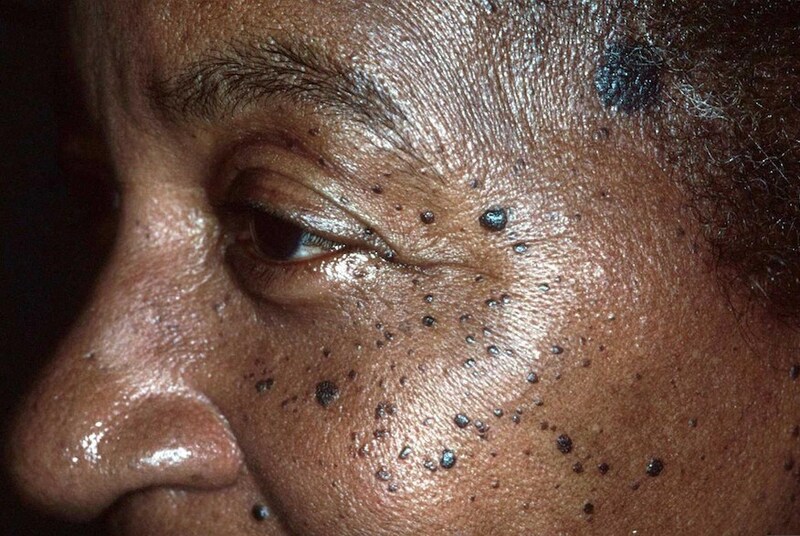 Dermatosis papulosa nigra, or DPN, consists of soft, dark brown, flattened or dome-shaped macules (discolored areas) or papules (areas of discolored and textural changes in your skin) that can be 1-5 millimeters in diameter. They appear smooth at first, but with age may become wrinkled and rough. 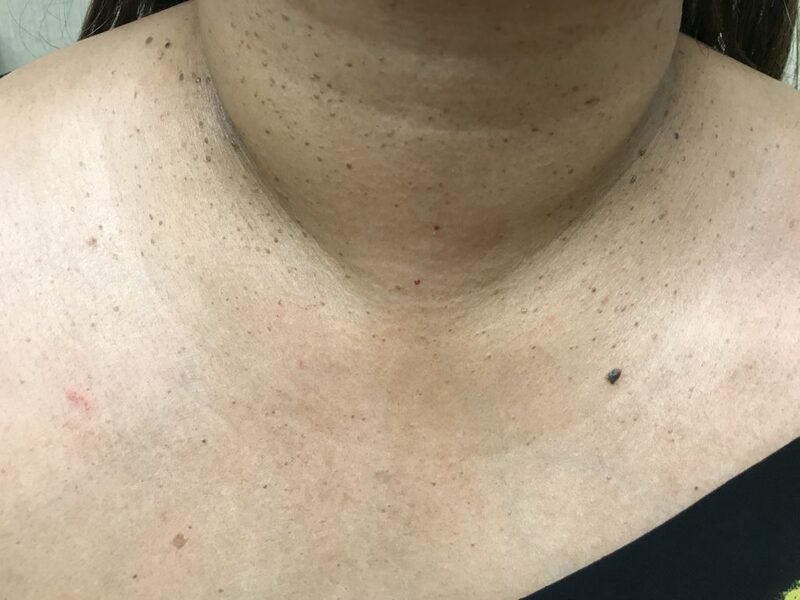 These dark spots are often found on the upper part of the face, including on the eyelids, neck, chest, upper back, and sometimes on the upper trunk. DPN lesions can appear as just a few isolated spots or number in the hundreds! They can start showing up in puberty, but if you have dermatosis papulosa nigra lesions, they’ll probably peak in number in about your sixth decade. Women get DPN at about twice the frequency of men, and there’s a genetic predisposition to the condition. Is DPN dangerous or harmful? The good news is, these lesions caused by dermatosis papulosa nigra are benign and superficial. Generally speaking, they shouldn’t cause you any irritation or pain. Still, some people feel that they don’t look great. And the one piece of bad news? They don’t go away on their own. And regardless, you’ll still probably have to have them checked out to make sure they aren’t another condition that simply looks like DPN. Basically, DPN appears on a cellular level like a seborrheic keratosis — benign, wart-like growths with a variety of clinical appearances, often caused by the excess proliferation of epidermal cells. But there are differences between seborrheic keratoses and dermatosis papulosa nigra. For example, DPNs usually develop at an earlier age, yet aren’t often seen in children. 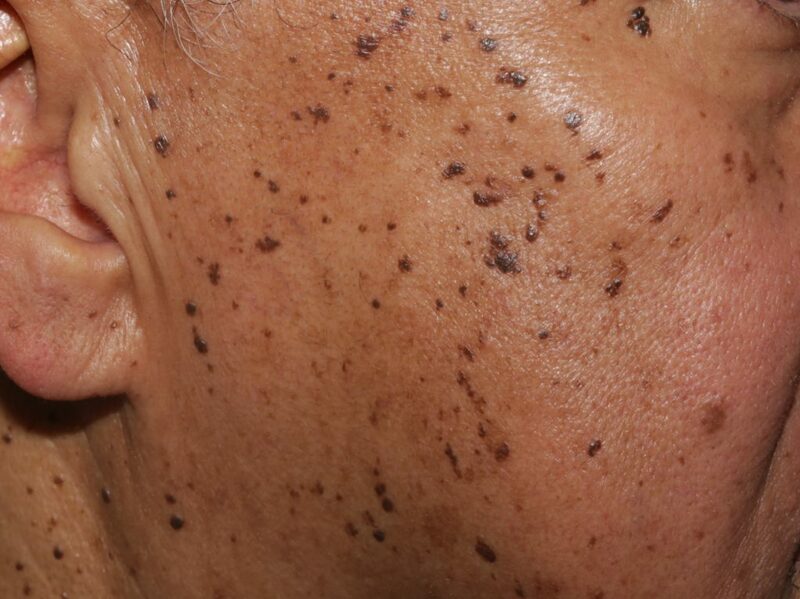 Most researchers believe that DPN is a variant of seborrheic keratosis. Specifically, doctors believe DPN is caused by a defect in the nevoid development of the pilosebaceous follicle, a great number of which are found on the face and scalp. Come again? Basically, the pilosebaceous follicle is a unit in our skin, and it includes a hair follicle and a sebaceous gland. Sebaceous glands are what create sebum (our natural oils) to lubricate and protect our skin. What should I do about my dermatosis papulosa nigra? Well, you actually shouldn’t worry! If DPN is what you have, it’s not a big deal, at least in terms of your health. Still, you may wish to go to your doctor for a differential diagnosis. A medical professional can diagnose it visually, or take a biopsy just to make sure your mole-like spots aren’t something more insidious. More often, people seek out treatment because they think DPN is unsightly. Electrodessication, considered to be the standard procedure here, consists of an electrode attached to the skin to dehydrate epidermal tissue. Other possible therapies include cryotherapy, snip excision, curettage, and dermabrasion. Lasers have also been utilized to create electrodessication that can treat DPN. But if you’re going to go the cosmetic removal route, you must make sure you choose a doctor with knowledge of and — experience working with — ethnic skin issues. Lasers especially often work by targeting areas of the skin based on wavelengths of liGHT (color). Increased melanin content on dark skin provides less contrast for laser targeting. If done improperly, this can lead to hyperpigmentation (darkening) or hypopigmentation (lightening). The other treatments mentioned may also involve risks of this kind, including scarring. You’ll have to be realistic about how well treatments will work, as it may be difficult to completely get rid of DPN. Minimizing the look might be the best that you can do. Before you visit the dermatologist, prepare yourself! And if you can, learn to love yourself the way you are — dark spots and all.